Liverpool and Nottingham Forest’s rivalry was a passionate if relatively short-lived one that burned brightly, some would even say fiercely, for a few seasons at the very end of the 1970’s. In the three seasons book-ended by 1978 and 1980, Liverpool and Forest pretty much dominated English football between them. The combined number of trophies won by the duo in these three years totalling eight (Liverpool three, Forest five) and a further four runner-up spots (two each) and three semi-final losses (all Liverpool) to boot. The two foes clashed thirteen times in those three seasons, with Forest winning four games, Liverpool three and the remaining six ending in draws. That, however, is only half the story. The story of Cloughie is well-known and, together with his achievements, will continue to be ascribed until kingdom come, but for anyone who’s spent their entire existence living in a cave and yet now, inexplicably, finds themselves reading this piece, a quick recap follows. He had achieved spectacular results at Derby County from 1967 to 1973, taking the provincial club from the depths of mid-second division to promotion, the league title and European cup semi-final, but then had seen his star drop almost as dramatically. An ill-advised and poorly conceived walk-out at Derby had been followed by a spell in relative anonymity at third division Brighton and Hove Albion before the allure of taking over the managerial hot-seat at Leeds United had proved too tempting to resist. As is well-documented, his 44 days in charge of the then reigning league champions was an unmitigated disaster and the sack soon followed. In early 1975 Brian Clough became manager of Nottingham and, arriving at the City Ground without his long-term assistant and buddy, Peter Taylor, things got off to a reasonably slow start at the City Ground. It wasn’t until two years later, following the subsequent arrival of PT, that promotion to the old (old) first division was finally achieved. 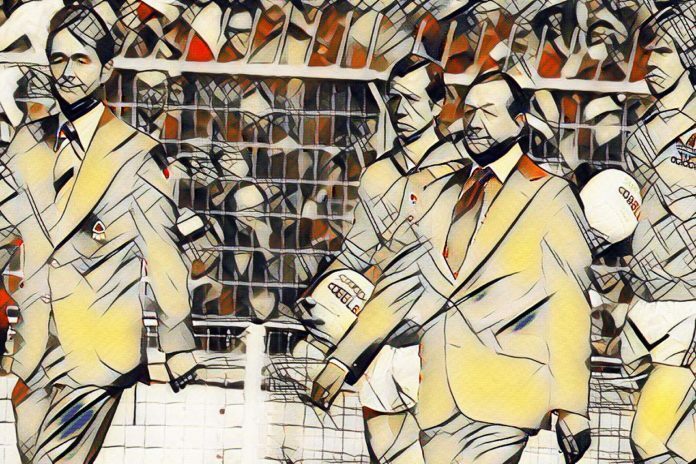 The summer of 1977 saw Liverpool safely ensconced on their perch as reigning English and European champions, and only a shock FA Cup final defeat at the hands of a Tommy Docherty-inspired Manchester United had prevented an unique treble being achieved. Bob Paisley was three years into his reign as Liverpool boss after taking over from the legendary Bill Shankly and already was well on his way to cementing his place into the Halls of Managerial Legends. The jury was still somewhat undecided on Brian Clough, on the other hand. Although the majority of football people were pleased to see Cloughie back in the First Division, Forest were not expected to do anything much more than survive comfortably in mid-table, made up as they were with a collection of players considered to be either journeymen or past their best. 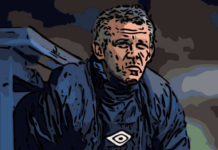 What subsequently transpired was a story that would arguably not be challenged as the greatest in club football history for close on another four decades prior to Leicester City’s Premiership win. Against all expectations, Forest hit the ground running with a 3-1 opening day victory at fancied Everton and never looked back. By Christmas they were sitting clear at the top of the First Division with Liverpool down in fourth six points behind, and on Boxing Day more than forty-seven thousand people were present to see Forest and Liverpool battle to a 1-1 draw at the City Ground. Additionally, with both sides also safely through to the semi-finals of the League Cup, the battle for domestic trophies was beginning to take shape. Successfully negotiating their way past Leeds and Arsenal respectively, Forest and Liverpool met in the League Cup final in what was to become the first real instalment in head-to-head clashes for supremacy. The initial game at Wembley followed what quickly became the norm in matches between the two sides, with Liverpool doing the majority of the attacking and having far more possession but being limited to few clear-cut chances, while finding a goalkeeper in inspired form. Whilst in matches to come it was ordinarily Peter Shilton acting as the obstacle to their ambitions, on this occasion it was reserve ‘keeper, eighteen year-old Chris Woods blocking the way to yet another trophy for the Anfield men. Playing in League Cup matches that season due to Shilton being cup-tied, Woods stopped everything Liverpool could throw at him and the game ended goalless. Four days later and the teams met in the replay at Old Trafford. The match was played in a similar vein to the first one, with chances being few and far between as Forest again holding steady against Liverpool’s sustained pressure, and then in the fifty-third minute of the game came the match’s turning point. Breaking through the Liverpool defence, John O’ Hare suddenly found himself clean through on goal with only Clemence to beat and long-legged, long-nosed, Phil Thompson in hot pursuit. Biding his time, Thompson lunged in on O’Hare with a desperate and calculated challenge on the edge of the area designed to stop him in his tracks. This he did, but unfortunately for Captain Beaky (and his band), referee Pat Partridge deemed it to have occurred inside the penalty area, rather than outside as Thompson had been banking on, and duly awarded a spot kick. John Robertson dispatched what was subsequently the only goal of the final and Forest had won their first major trophy in the Clough-Taylor era. Afterwards Liverpool complained long and hard both that the better team over the two games had lost, and that their attempt at cheating had been foiled. Forest for their part were of the opinion that Liverpool were simply poor losers and were now guilty of expressing sour grapes. Whatever the truth of the matter, the bad feelings from the cup final lingered and a rivalry was born. The second league game took place right at the end of the season with nothing at stake except pride and bragging rights. With the title long since won by Forest and second place already clinched by Liverpool, more than 50,000 turned up at Anfield to witness both sides’ last league game of the season end up goalless. Once again match reports of the game show Liverpool did most of the attacking, and once again suffer from a perceived penalty injustice. This time, however, it was the referee’s decision to not award one that earned their ire. David Fairclough was seemingly chopped down in the area by ex-koppite favourite Larry Lloyd only for the referee to wave play on in what the Liverpool Echo described as an ‘unbelievable’ decision. Forest won the league by seven points, with Liverpool finishing runners-up. Liverpool did, however, have the consolation of winning the European Cup for the second consecutive season to keep them going through the long summer months. The next season saw a reversal in the teams’ fortunes. This time it was Liverpool who won the league at a canter, eight points ahead of Forest in the runners-up spot, and Forest who took the European Cup after knocking Liverpool out along the way! For only the second time in history England was represented by two sides in the European Cup, and unlike the previous occasion in the 1968-69 season when the two Manchester clubs taking part in the competition (City as league champions, and United as European Cup holders) had been kept apart, this time England’s finest were (with the help of ‘warm balls’ perhaps?) drawn together in the first round. Liverpool were unbeaten in Europe in three seasons, winning the UEFA Cup in 1976 before successive European Cup wins in ’77 and ’78 and would surely have too much nous and experience for a side playing second division football just fifteen months previously. That was the common thinking, anyway. As it turned out, it was the newbies who played like seasoned old hands while the more experienced side crumbled and performed like novices. Trailing by a single first half goal, Liverpool seemed to forget they were in the midst of a European game at all, and promptly went chasing an equaliser when ordinarily a 1-0 defeat away from home in the first leg would have been something to settle for. The inevitable happened and a late Garry Birtles goal left Liverpool needing to climb a mountain in the second leg. 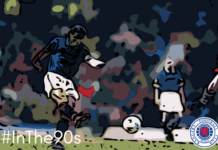 Despite an evening spent pretty much camped in and around the Forest penalty area a fortnight later, the tie produced no further goals and the holders and favourites were unceremoniously dumped out of the competition. Once again, this needled Liverpool and their players intensely. The feeling amongst certain of their brethren was that in Forest – Liverpool clashes only one side wanted to play while the other was content to defend in numbers and try to hit on the counter. Graeme Souness and Phil Thompson were particular critics of their Forest counterparts at the time, and felt Forest were little more than well-drilled spoilers with a limited shelf-life. As the 1978-79 league season got into full swing, Forest were in the midst of a year-long unbeaten league run. After suffering a third and final league defeat of the 1977-78 season on 19 November 1977 at the hands of Leeds United, Cloughie’s men went more than a whole calendar year and forty-two matches unbeaten before rocking up at Anfield on 9 December 1978. Liverpool at this stage were top of the league but had lost twice, while Forest were in fourth spot, six points behind, courtesy of having drawn nine of their sixteen league matches at that point. For the first time in seven clashes between the two, Liverpool at last got the upper hand, and a Terry McDermott brace (one a penalty) to nil, finally gave Liverpool some joy. The two sides then went on their merry ways for the rest of the 1978-79 season and did not meet again in domestic cups, with Forest retaining the League Cup and Liverpool surprisingly being beaten in the semi-final of the FA Cup by Manchester United. The next league meeting took place in April 1979 with Liverpool sitting pretty at the top of the table, six points clear of West Bromwich Albion in second and a further point and place ahead of Forest, who had three days previously won through to the European Cup final at the first time of asking courtesy of a 4-3 aggregate victory over FC. Cologne. Perhaps not surprisingly, the match turned out to be one of the most notably low-key of clashes between the two and neither side was particularly dismayed by the goalless outcome. 1979-80: Boiling over – Penalties Ahoy! The 1979-80 season kicked off with Liverpool reigning League Champions and Nottingham Forest European Champions and League Cup holders, and nine months later it could be said that the season had unfolded in almost an identical manner to 1978-79. Liverpool retained the title and lost in the semi-final of the FA Cup and got knocked out of Europe in the first round, while Forest retained the European Cup and reached the League Cup Final for the third consecutive season. Here the wheels came slightly off, though, and their quest for a treble of wins was foiled by a bizarre mix-up between Dave Needham and Peter Shilton that allowed Andy Gray of Wolves to score the game’s only goal. The first league match up between the sides took place at the City Ground at the end of September and a single Garry Birtles goal was enough to give Forest the points and leave them joint top of the division with Liverpool floundering back in ninth spot. By the time the two sides met again, Christmas and New Year had been and gone and once again the battle for the ascendancy was well underway. With the possible luck of the ‘warm balls’ again, the sides were drawn together in both the League Cup semi-final and the FA Cup fourth round, with the FA Cup game sandwiched between the two legs of its illustrious little brother. All was thus set for a series of matches that finally brought to a head the animosity that had been threatening to blow for two-and-a-half seasons. The first match was the League Cup first leg at the City Ground, and for eighty-nine minutes on a mud heap of a pitch Liverpool finally seemed to have got it right. A Forest-esque rearguard display kept the score line blank until the last minute. However, a slip and a slide in the penalty area resulted in Ray Clemence being judged to have fouled Birtles and, once again, John Robertson slipped the resulting penalty home. A 1-0 defeat away from home was not a bad result, but once again Liverpool, and Souness in particular were livid at the perceived injustice of it all. Again, Liverpool felt that not only had they been the better side, but that an unjust refereeing decision had cost them. The two teams met four days later back at the City Ground in the FA Cup, and neither the pitch nor certain players’ tempers improved in the intervening period. Of all the games between the two sides over these seasons this was the one that most often threatened to get out of hand. At times it became a war of attrition with Larry Lloyd, once of Liverpool but now at the heart of Forest’s defence, jumping so hard into the back of David Johnson that the unfortunate Liverpool man literally jumped out of both his boots at the same time. Souness, for his part, got somewhat characteristically stuck-in and at one point in the afternoon’s proceedings cheerfully shook Forest captain, John McGovern by the throat while threatening to dispatch him into the River Trent. Somewhere in the midst of all of this a football game broke out and Liverpool gained their only cup success of the period against Forest by way of a 2-0 victory, with once again a McDermott penalty proving crucial. So, with one game won apiece, it was off to Anfield for the second leg of the League Cup semi, and once again Liverpool were hot favourites to teach the young upstarts something about two-legged football. Once again, though, things didn’t quite go to plan. Early Liverpool pressure counted for nothing, and a defensive lapse after twenty-five minutes led to yet another penalty being conceded, and for the third and final time, John Robertson stepped up to slide past Clemence. If being one down against Forest was in those days akin to attempting to climb a mountain, being two down was not far removed from attempting an ascent on Everest dressed only in a waistcoat and sandals, and Forest eased out the remaining time in relative comfort. A last minute equaliser on the night from David Fairclough was academic only in that it preserved Liverpool’s two year unbeaten home record in all competitions. So, once again Forest had prevailed in a cup-tie against Liverpool when Liverpool had been fancied to progress. The animosity between the two sides had reached a peak, on the pitch at any rate, and the fact that Forest had the definite edge over Liverpool when it seemed to matter, only served to fuel the flames amongst certain players who, perhaps, were not that used to consistently coming off second best. Off the pitch too a rivalry had built up amongst certain sections of each sides’ support, and there was a definite edge on the terraces that remained long after the direct battle for supremacy between the sides on the pitch had ended. Indeed both Liverpool and Forest fans would sing classy songs about ‘hating’ each other right up to the 1989 Hillsborough disaster. However, even at the height of their rivalry there never seemed to be any untoward animosity between Brian Clough and Bob Paisley and both men spoke warmly of each other and each other’s teams in public. The final league match of this three season-spat came one week after the second leg game and was once again back at Anfield. Forest came on their usual bus and parked it in their usual spot, and it took two late goals by McDermott and Ray Kennedy to assist Liverpool in their pursuit of their twelfth league title. Following this match, though, there was a feeling that perhaps this particular rivalry had run its course. After winning the European Cup for the second time in May 1980 Nottingham Forest never truly challenged for the game’s ultimate prizes while Liverpool, for their part, famously and methodically went on to dominate the 1980’s. Maybe in a sense Graeme Souness was proved right in his assertions that that particular Nottingham Forest side did indeed have a limited shelf-time, but anyone who was around to witness the battles between sides led by two of the greatest English managers of all time surely remembers them with warmth. If you enjoyed this then follow me on twitter @davidnesbituk and follow the tremendous work of our team @taleof2_halves were you can find our work.